Partners: LCA & parteners, Pasquale Di Lorenzo, Nicola Perrotta, Maria Angela Rea, Niroscia Pagano. Venice has a symbiotic relation with water, swinging between love and hate. They love each other when they merge into each other, when the tide gently laps the city and the shapes of ancient buildingsare reflected on the choppy surface of the lagoon. At the same time, Venice hateswater because it is the cause of the main structural problems resulting from their interaction. 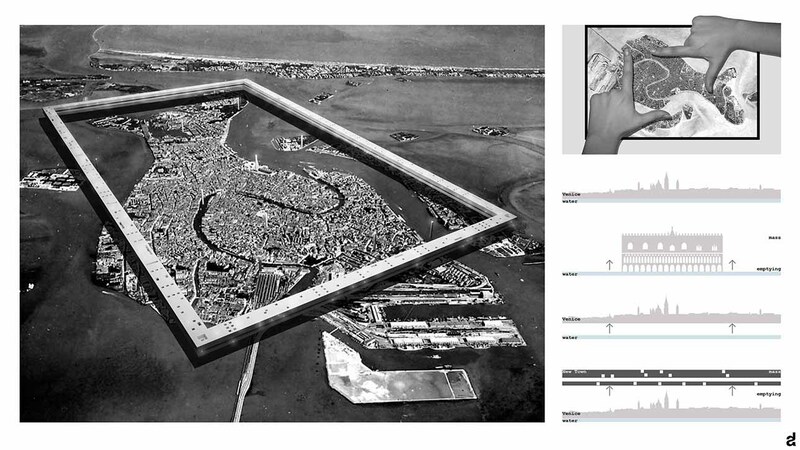 The main aim of the project is to provide a view of the contemporary city raising the viewpoint above the ground, enclosing Venice in a huge frame.From this new point of view the city can look at the real matrix of its own identity without blending into it, fixing its meanings and essence, and especially its modernity. Through this sort of yard, the new city can look at its history,as standing on a balcony looking at the outdoor museum that Venice represents, unchanged in its romantic appearance and protect from a glass bulb. 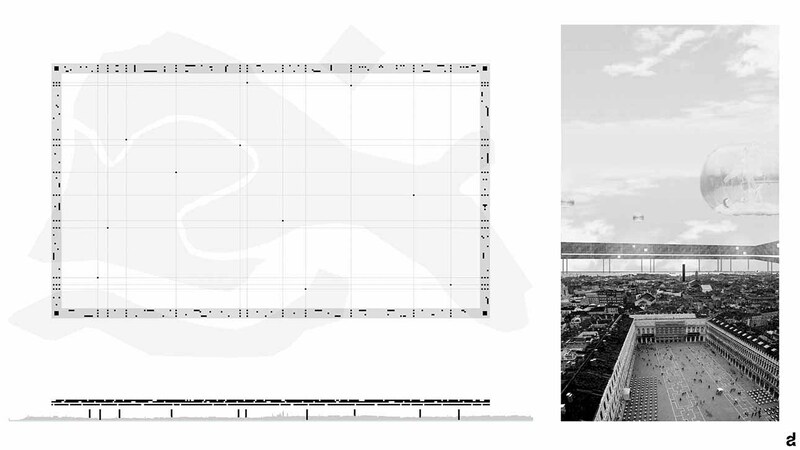 The two surfaces will be linked to the mainland through vertical structures, structural elements of the frame and, at the same time, nevralgic points of a new way to communicate, easy and fast. The new structure hosts everything is needed to make Venice inhabited again, as such as residential areas and spaces designed for the community, facilities useful for private and public activities.